Medical nanobiotechnology, the application of combined nanotechnology and biotechnology in medicine has revolutionized our understanding of diagnosis and treatment of certain diseases. The field of nanobiotechnology has experienced unexpected advances throughout the last decade and as the result has attracted much attention from scientific communities and even public (1). We are at the edge of a new horizon in molecular medicine: convergence of these two disciplines has increased our ability to apply novel treatment tools and methods in cancer biology which were 20 years ago might have been difficult to imagine (Figure 1). Nanobiotechnology which invloves usage of defined nanoparticles i.e. metals, polymers, lipids and carbon with a potential to be conjugated with molecular markers to achieve unprecedented protocols like molecular targeting, molecular imaging, and directed diagnostic tools can contribute to optimize cancer treatment (1, 2). The major obstacle in cancer drug delivery is known to be selective drug delivery which might be overcome by employing specific cell/molecular indicators combined with certain synthesized nanoparticles (3). However, the unique characteristics of nanoparticles enable biomedical researchers to create a variety of products and applications ranging from basic biological science to advance molecular medicine. It is worth mentioning that combination of nanomaterial science which is at the scale of the building blocks of cells and that of biotechnology has empowered the scientists to develop devices much smaller and more efficient than the ones currently commercially available. One of the most compelling efforts of the 21st century was to study the genome and the proteome with the help of nanobiotechnology which are called as nanogenomics and nanoproteomics, respectively. Creating predictable 3D structures using new nucleic acid-based materials and joining sticky ends of DNA motifs to produce DNA polyhedral catenanes which facilitate the production of smart materials is a new era in structural DNA nanotechnology which is currently developing (3). On the other hand, RNA nanotechnology has been evolved based on versatility of RNA in its structure and function. Manipulation of RNA molecules to design an engineered artificial 3D structure can produce diverse structural motifs which might be useful in nanodignostics and nanotherapeutics (3, 4). The focused approach of application of nanobiotechnology to proteomics in medicine is termed as clinical nanoproteomics which deal with protein detection, identification, purification and display. Conjugation of a specific antibody to a defined nanoparticle has changed/improved many protocols and reached to nanoscale protein analysis especially for those low-abundance proteins. Targeted proteomics is an advanced branch of clinical proteomics and includes analysis of subsets of the proteome that show a particular phenotype, e.g., affinity to bind to a specific DNA sequence (5-7). 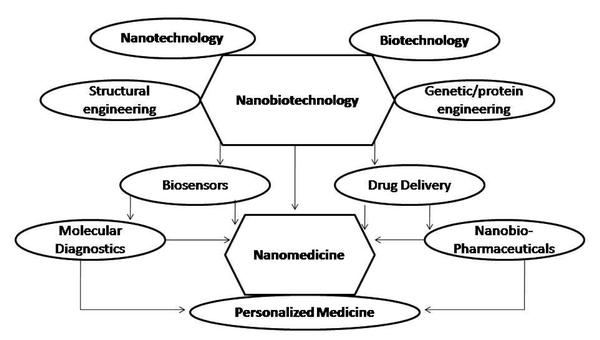 One of the distinguished applications of medical nanobiotechnology is known as nanobiotechnology for cancer therapy which demonstrates the following advantages and will be available in near future: (i) improving potency: the delivery of a massive therapeutic payload per target site; (ii) improving selectivity: the ability to carry multiple targeting agents; (iii) enabling targeted combination therapies: the potential to contain multiple therapeutic agents (8, 9). Certainly, in near future, medical nanobiotechnology might be our best hope to achieve our ultimate goal: the personalized medicine which could be defined as the individualization of prognosis, diagnosis and treatment for each patient. Variation in human genome has to be taken into consideration and so specific therapeutics seem to be needed. Thus medical nanobiotechnology will play a major role in modern medicine. Personalization of certain therapies such as cancer therapy need new techniques to design smart molecules i.e., smart biosensors for better diagnosis and more importantly, targeted drug delivery. All these would come true if we have maximum productivity in nanobiotechnology research based on our undergraduate and postgraduate training and research endeavors. Financial Disclosure: There are no financial interests to disclose.